Donald Trump has finally pivoted—right into a full embrace of Goldman Sachs economics. For years now, pundits have been tantalized by the notion that Donald Trump would make an historic pivot, roll back his most chaotic ideas, and return to the comfortably narrow range of political debate. During the campaign, Trump always frustrated this triumph of hope over experience. But in the last several days, Trump has actually pivoted. It’s just that he’s pivoted into Jeb Bush. Coinciding with (and presumably motivated by) the ceremonial throwing-under-the-bus of Steve Bannon, Trump flip-flopped on at least half a dozen campaign promises just on Wednesday, in an embrace of the politics of National Economic Council director and ex–Goldman Sachs president Gary Cohn, who I guess is honorary president now. Some may breathe a sigh of relief that Trump has ditched his white-supremacist sidekick and thrown in his lot with global cooperation and harmony (though the continued presence of Jeff Sessions and the rise of a national deportation force suggests Bannonism is more alive than Bannon, at least in some areas). But Cohn-ism is also deeply harmful to any American outside of an executive suite. The new agenda is rooted in aggrandizing the economic power of the 1 percent and keeping the tide of corporate welfare flowing. It turns out Trump doesn’t resent elites; he just wants their approval. Plenty of reporters noticed the flip-flops, most of them encapsulated in one interview with The Wall Street Journal. Fewer saw the true context. Let’s take the flips one by one. • Trump told The Wall Street Journal that China was not a currency manipulator, after saying the opposite for years. This is generally true for the moment, though not a guarantee of future results. But everyone can see the real signal here: a less stringent crackdown on Chinese mercantilist policies. The manufacturing workers left in America would like to be able to compete, but multinationals do too much business in China (and across Asia, where currency manipulation is ongoing) to want to disrupt their supply chains. This presages more races to the bottom for the cheapest labor available. More troubling is Trump’s admission that he offered China a “better deal” on trade if they helped defuse the genuinely frightening North Korea situation. That fits hand in glove with neoliberal strategy on trade for decades, to use market concessions as a bargaining chip to obtain national-security or geopolitical goals. One day it’s cooperation on North Korea, the next it’s extending spheres of influence in Latin America or South Asia. The trade is always the same: geopolitical desires outpoint economic ones. America first, the American middle class second. • Trump managed to do some currency manipulation of his own in the same interview, musing that the US dollar was “getting too strong.” This sent currency trading markets plunging. While a weaker dollar could help US manufacturing over the long term due to cheaper export prices, the important factor is the reason for the weakness. An artificial drop from a norm-breaking presidential statement on the direction of the currency would do little in the long term, but it does increase volatility—which is great for those who facilitate trades in financial markets. You know, like Goldman Sachs, to use a completely random example coincidentally connected to the head of the National Economic Council. • Trump reversed himself by suggesting openness to re-nominating Janet Yellen at the Federal Reserve. This would be a triumph for monetary-policy certainty, something big business craves. But Yellen’s Fed has also dedicated itself to keeping inflation low. In fact it’s been below target for her entire Fed tenure. That makes financiers happy, as does the gradual interest-rate rise Yellen is carrying out. • Trump now supports the Ex-Im bank, following President Obama’s lead. Ex-Im has always accompanied such shifts; parties criticize it when out of power and support it when in power. In back issues of The Nation you can find liberals railing about the distasteful corporate-welfare schemes of the “Bank of Boeing.” And the truth is actually closer to what Trump said in 2015, that Ex-Im’s assistance lavishes subsidies on a few very large companies, and provides support to seriously retrograde policies like building coal plants. • Then at a press conference with NATO Secretary General Jens Stoltenberg, Trump walked back comments that NATO was obsolete, and sang the alliance’s praises in one of those long speeches Trump probably didn’t see until the moment he read it. NATO policy doesn’t have an obvious economic component, but maintaining global geopolitical order, while positive, also entrenches the world’s economic superpowers and enables them to more cooperatively lean on everybody else. It would not be out of place to see Jeb Bush endorse every single one of these positions. They reflect the stodgy business Republicanism America has come to expect since the 1980s. We’ve already seen an extreme focus on the core Republican ideas of deregulation and tax cuts. Now we can add in Cohn-ism, which reveres globalization, puts the US market into a bidding war to achieve geopolitical outcomes, hands out gifts to financial interests and multinationals, and keeps the global pecking order stable, with the United States firmly in imperial control. Please clap. You could also cite White House budget director Mick Mulvaney’s interview with CNBC, which revealed that he doesn’t care about deficits if they get in the way of tax cuts, as has been true since at least Reagan. Mulvaney’s more concerned with eliminating wealth-transfer payments from rich to poor. That’s part of Cohn-ism too: centralizing wealth and power at the top. It’s not just about running the country like a business, but for business’ benefit. We also know Cohn supports the White House infrastructure boondoggle, giving tax breaks to private investors for equity stakes in projects that will generate huge returns through user fees. He wants to strip away financial regulations and allow investment advisers to rip off their clients. And if you think his random kind words for restoring Glass-Steagall firewalls between investment and commercial banks reveal some liberal heart beating inside, consider that the short-term consequence of that would be to block Bank of America, Citigroup, and JPMorgan Chase from competing with Goldman Sachs, his old firm, for investment-banking business. You don’t have to hate all of these ideas to see that the components of Cohn-ism fit together, and that they suggest a world that’s great for private-jet fliers and gated-mansion denizens, but less so for you and me. What Cohn seeks is nothing less than a restoration of a ruling class that utterly failed the country for the last decade-plus. And Donald Trump is right there with him, desperate to curry favor with people richer than he is. To borrow the characters from Caddyshack, Trump is Al Czervik if he actually wanted Judge Smails to like him. 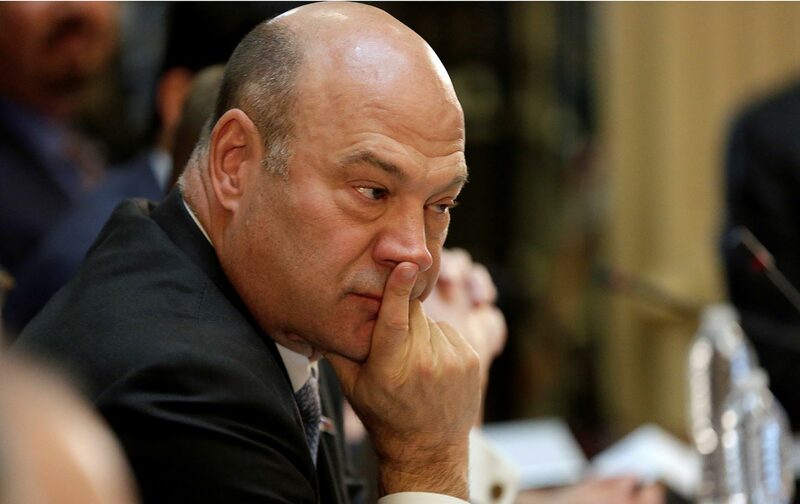 Let’s learn a little about our new president, Gary Cohn. He was the guy who ran Goldman’s mortgage department, turning it into an enormous trading operation that fueled the housing bubble. He was the guy who then bet against the housing market without disclosing that to investors, illegally ripping their faces off for profit. He was the guy who exported deceptive finance schemes to Greece, facilitating their decade of depression. He’s now putting that disregard for anyone not in an Italian suit to work for you. If you liked Goldman Sachs pulling the strings in Washington, you’re going to love it when they’re actually running the show directly. He’s also going to be as toxic for Trump’s approval ratings as Bannon before him. Breitbart comment threads now thunder against the rise of the globalists routinely. Cohn-ism, tied to the most hated company in America not named United Airlines, will cost Trump his base without picking up anyone else, plumbing new depths of opposition. Before long Trump will be as popular as Jeb Bush, too.